Trek to Kalsubai Highest Peak in Maharashtra (One Day Trek with Overnight Travel). 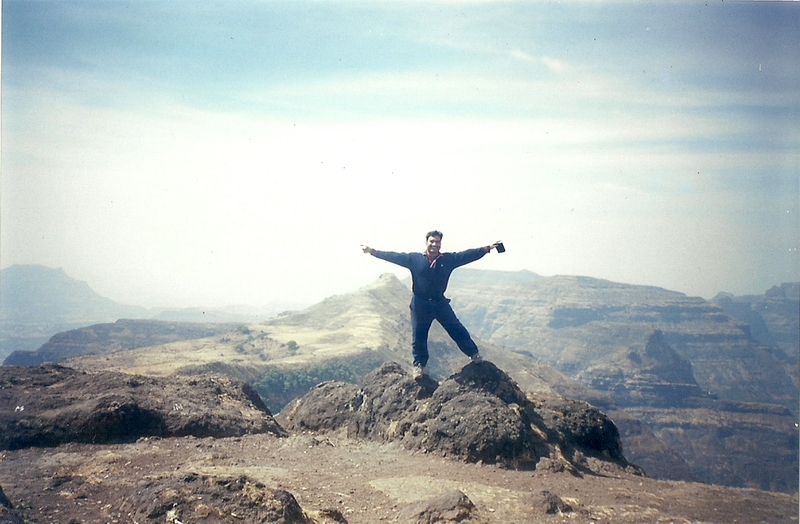 Experiences: Adventure Trek, Scrambling, Summit Climb, drive to the base village goes through rural countryside of Maharashtra. Rs.2000/- per head. (Multiples of 6 persons), Transport Tavera / Scorpio equivalent. will accommodate upto 6 participants + 1 Guide. for group size of 12, 2 guides..
Rs.1750/- per head. (Multiples of 20 persons). Mini-Bus will accommodate upto 20 Participants + 2 Guides. Village Breakfast, Fixed packed dry Snack for trek from our side (note: we recommend that you carry personal snack pack like chocolates; salads; fruits; dry fruits etc) and Evening village Tea/Snack. Meals during travel, bottled water; or any-other items not specified. 05:00 am arrival at Bari, rest and refresh at Temple / School Complex in village. Return Journey after tea at village. Personal first aid; (General 1st aid will be available with team). Change clothes.. small towel (Leave back the change clothes in the Tempo). Water bottles per person (Carry 4 of them) 2 of them for trek. Back pack to carry your person stuff for the day. 3 Plastic Bags.. 1 for keeping our change clothes and 2 for double protection to keep all your belonging before you tuck them into backpack. Kalsubai Peak (Marathi: कळसूबाई शिखर) is the highest peak (1646 meters / 5400 feet) of the Sahyadris in Akole Taluka, of Ahmednagar district of Maharashtra, an Indian state. 'Kalsubai' temple is located at the topmost peak Kalsubai, a local deity. A traditional prayer (pooja) service is held every Tuesday and Thursday by a local priest. On Navratri occasions many stalls are set up atop the summit for the pooja materials. During the Navratri period, for all nine days, special poojas are carried out and idol is fully decorated. To reach the summit there are various trekking routes and animal tracks. The main route starts from the village of Bari which is about six km from Bhandardara. To reach Bari, one has to travel to Igatpuri on the Mumbai Nasik route. From Igatpuri take the early morning bus (at around 5.00 am from the Igatpuri Bus Stand) going towards Pune and alight at Bari. Those who want to reach from Mumbai, easily travel through local train in morning hours and get down at Kasara station. From Kasara one can get buses and share taxis to get down at Bari. The main route to the temple is at small climbing slope. It usually takes three to four hours to reach the top from Bari. Soon after leaving Bari, a small stream is crossed followed soon after by a Hanuman temple. The route from behind this temple takes the hiker straight to the summit. There are three iron ladders along this route. There is a well near the last iron ladder as one approaches the top but the water is not potable during the summer. The rest of the route is without water, so it is best to fill water bottles in Bari. It is an easy hike, but parts of it are quite steep in places. The vastly spread out backwaters of Bhandardara attracts ones attention from the top. To the north of the mountain range forts such as Ramsej, Harihargad, Brahmagiri, Anjaneri, Ghargad, Bahula, Tringalwadi, Kavnai can be seen. To the east one can spot Aundha, Vishramgad, Bitangad, to the west Alang, Madangad, Kulang, Ratangad (south west) and to the south Pabhargad, Ghanchakkar, Harishchandragad can be seen. Food and Transport as per policy in inclusions para. Tips; shopping; cost of insurance not included. Road Tolls; Parking; etc not included (unless specified). Anything that in not specifically listed in inclusions is excluded. Any kind of insurance is not included. Subject of Cancellation Should mention: Cancellation of Trip (Trip Name; Trip Date). The email should also have your cell number and other contact details. Check list for the trek (Dry season). Hand Sanitizer, Sun Screen, Sun Glasses etc.